The Excel Sonic Clean uses two elements, ultrasonic vibration and cleaning liquid to efficiently remove clogged ink and coating materials from cylinder cells. 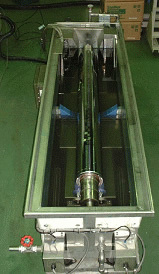 Processes shafted and shaftless cylinders without adapters. 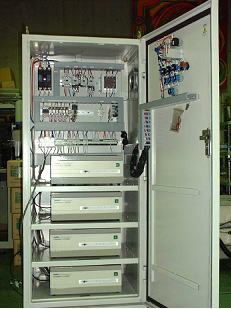 Capable of processing cylinders of varying sizes. Incorporates a cleaning tub made of long-lasting stainless steel. Recognizing the importance of reliability and ease of maintenance, the product comes with a cleaning tub and oscillator. Use of this product does not require a notification as it does not fall under the Radio Act’s category of ultrasonic equipment. The product provides three types of cleaning solutions that can be used depending on the application being utilized. Equipment which possesses only a cleaning function, as well as equipment installed in close proximity to the printing press, can be constructed of material that is semi-explosion proof upon request. Fuji Shoko provides cleaning tests upon request. 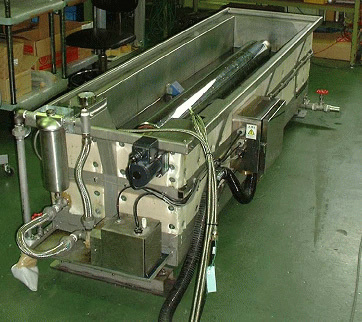 An ultrasonic cleaning device employs an ultrasonic cleaning solution together with an ultrasonic vibration system to remove cell residue in the cylinder. When a cylinder is immersed in the cleaning solution, and an appropriate ultrasonic frequency is applied, the vibration caused by the ultrasonic frequency instantly creates bubbles around the cell, and the bubbles disappear as if they exploded. From there, the impact from the explosion of the bubbles causes a peeling of the residue within the cell. Copyright (c) FUJI SHOKO CO., LTD. All rights reserved.